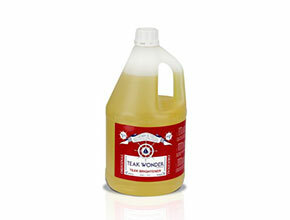 The TEAK WONDER® brightener is a lightening which serves to eliminate from tek any ombrature which may persist even after the application of WONDER® TEAK CLEANER. The application of TEAK WONDER® brightener is not always necessary, but the use of “experienced” surfaces, remained a bit ‘dark and shadowed despite the cleaning treatment, has an effect that may even seem miraculous: teak immediately regains natural shade of the one just sanded, without, however, removing precious millimeters of essence. The application must be made on the deck still wet from the rinsing of WONDER® TEAK CLEANER, sprinkling it with a modest amount of teak brightener WONDER®, but taking care to distribute it evenly to avoid a patchy result: the clearing of teak is immediate, contact . Just completed the application, rinse again and abundantly covered with fresh water. The product is neither caustic nor aggressive and does not damage the seams of rubber, paint or hardware store. Once dry, the surface is ready for application of the protective TEAK WONDER® DRESSING & amp; SEALER. Clean any drips on the surfaces not teak.